The United States has a long history of government investment in biomedical research, resulting in a populace with an increased life expectancy and improved quality of life. Unfortunately, while other nations endeavor to copy the country’s highly productive system of competitively funded science, NIH funding has failed to keep pace with scientific opportunity and rising costs. Following closely behind our story on the lack of sympathy for biomedical research in the omnibus bill, the Federation of American Societies for Experimental Biology (FASEB) released an analysis on NIH funding for biomedical research late last week. The Federation of American Societies for Experimental Biology (FASEB) is the largest coalition of biomedical researchers in the United States, representing 26 scientific societies and over 115,000 researchers worldwide. FASEB is recognized as the policy voice of biological and biomedical researchers. The Federation’s mission is to advance health and welfare by promoting progress and education in biological and biomedical sciences through service to their member societies and collaborative advocacy. The analysis illustrates the devastating effects congressional budget cuts have had on NIH funding since 2003 (and further back when you consider grant awards). Lack of sustained investment in the NIH is resulting in the loss of a generation of promising researchers to other careers and other countries. Adjusted for inflation, the NIH budget in fiscal year (FY) 2013 was $6 billion less than it was in FY 2003. 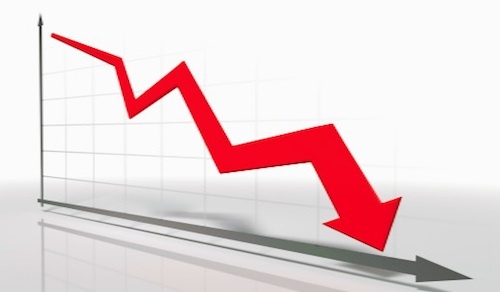 Annual funding has been decreasing at an approximate rate of 1.8% each year. In constant dollars, that’s a decrease of 4.7 billion in funding over ten years. Consequently, the number of competing research project grants awarded by NIH has also fallen sharply, with 20% fewer grants in 2013 than in 2003. Awards for supporting investigator-initiated research (R01-equivalent grants) have suffered even worse, decreasing by 34% since 2003. This nation has a long, proud history of government investment in biomedical research, and, as a result, people are living longer and more productive lives. But much remains to be done. For millions of Americans still suffering from disease and disability, research is their only hope. In the words of NIH Director Francis Collins, “we are at a moment of exceptional opportunities that demand exceptional attention if their promise is to be realized.” Moreover, the damage done in 2013 may have consequences years and even decades from now. The funding cuts and government shutdown of last October ended support for many young researchers and sent a discouraging message to a generation of promising students and early career scientists. Other nations strive to emulate our highly productive system of competitively funded science. But for the past decade, our progress in medical research has been curtailed because funding for NIH has failed to keep pace with scientific opportunity and rising costs. Today, as China and many other nations are increasing their investment in research, U.S. Research & Development expenditures are contracting. Other funding sources were unable to fill the vacuum; industry and state funding for research have also declined dramatically. 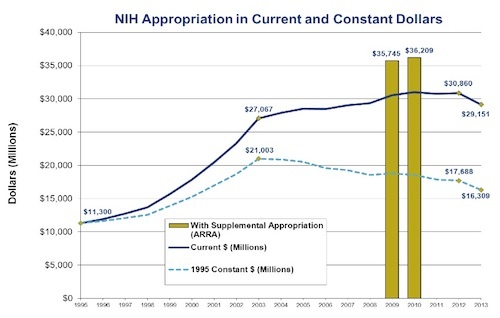 The Consolidated Appropriations Act of 2014 included a desperately needed increase for NIH. The increase, however, will not return all of the funds cut by sequestration, nor does it restore the lost purchasing power. It is an important step in the right direction. For the sake of our future, we hope that it is the first of many such steps, and FASEB urges Congress to restore the cuts and sustain the federal investment in NIH with an appropriation of at least $32 billion. Congress passed its 2014 budget on January 13th, increasing the NIH budget to $29.9 billion, which fails to return all of the funds cut by sequestration. The revised NIH budget is less than the appropriations made in 2013.